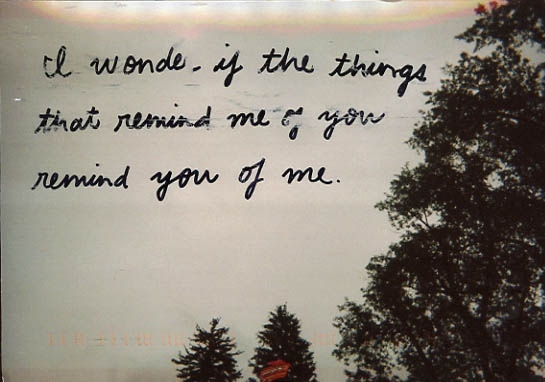 I saved this pic from PostSecret probably somewhere around last September. It was after our lovey “alphabet macaroni on bread” breakfast in bed day. She also gave me a packet of “sheep’s droppings”, a souvenir which she bought from her New Zealand trip that month. I took plenty of pictures of the “droppings” that day because it was cute but she said I couldn’t keep it so I had to finish it before it expired. She was updating our “This is not a book” book while eating the breakfast I made for her. It was quite yummy, if I say so myself. Ha. We had a lovely time that day staying in the air-conditioned room, watching tv, eating, taking pics, snacking, playing, laughing, doing activities that two adults in love with each other do, spooning and cuddling. Yes, we are pretty good at enjoying life. So I saved this pic while she was away for work. I was missing her so so much and everything reminded me of her. When I saw this on PostSecret’s blog post that week, it gave how I felt a voice. It had managed to sum up what I felt about her accurately.